It is with humble apologies that I have to report that tonight’s screening at the Bioscope Festival of Lost Films is not going ahead. There have been problems with the film chosen for our last screening, from the sudden likelihood that part of it had survived (which subsequently proved not to be the case), but more seriously that its sober subject matter did not quite suit the air of ironic whimsicality which is the hallmark (we think) of this Festival. There was a film in reserve (there are many lost silent films, as we know), but your programmer is leading a busy life at the moment and both time and energy have run out. Thought was given to postponing the festival for a day, but the cinema manager has been awkward, and the organist we had hired (a certain Dr Sargent) was demanding ruinous expenses for being kept on for a second evening. All in all, the wiser course of action is to call it a day at four shows, and to return to lost films (perhaps as an occasional series) another time. To all festivalgoers, you may of course obtain refunds from the festival office, and I hope that no one was put to too great an expense over costume hire. 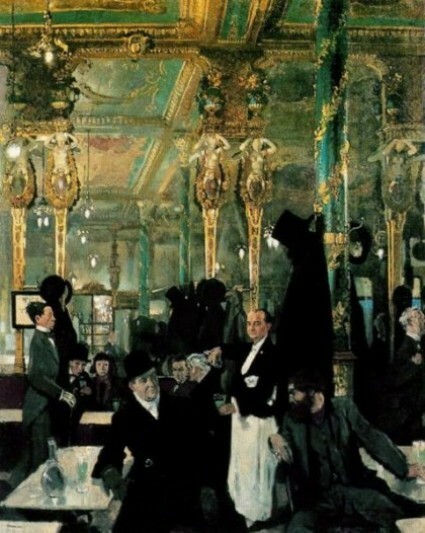 There is just enough left in the kitty (once the organist has been paid off) for us to have our promised end of festival soirée at the Cafe Royal (itself soon to be no more), where we may toast lost films and consider that not only is vita brevis, but sometimes ars is brevis too. I am positively crushed. But one understands that the tempo of modern life can be unrelenting, and all in all, it was a most enjoyable and intellectually stimulating festival. Fortunately I have one final gown to wear to the Festival soiree, my Fortuny Delphos (although…perhaps too daring?). I believe War Brides was my favorite offering of the festival, one has so little opportunity to see Madame Nazimova’s early films and so much has been written about Brides that I have been most curious. I must thank those at The Bioscope Towers for unearthing this treasure. Although I am happy to have seen Das Mirakel, I’ll admit it’s one of those films I am happy to have seen and now do not have to see again. I am still not quite sure how to respond to the Picture of Dorian Gray; the cognitive dissoance lingers since I don’t usually intellectually combine the concepts “Russia” and “Oscar Wilde.” I may have to wait for the dvd release and review it again. My feelings about the Jeffries-Sharkey fight are already on record. Erm. Thank you, Bioscope, for all the hard work in planning and organizing one of my favorite film festivals. I had a lovely time. I am sorry to have messed things up. The final film was to have been Auction of Souls (1919). Its controversial subject was the Armenian genocide in 1915, and it was based on the memoir by Aurora Mardiganian, who also took the leading role. A remarkable subject for an American film, my interest being sparked by British censorship records, but then I found the Anthony Slide book about the film, which covers every detail. The story of the exploitative way in which Hollywood treated Mardiganian and the reactions the film received all would have made an interesting read, but I couldn’t get the tone right. The reality behind her experiences is so shocking (and the exploitativeness therefore so troubling) that it just felt wrong to go on with it. I’ll write a Footnotes to the Festival piece on the sources used. And ponder on the mystery of a lost film that was lost for a lost film festival. Anthony Slide also covers this film in a few pages in his “Early American Cinema”. I guess the subject really interested him and he later devoted an entire book to it. Life is what happens to you when you are not sitting at a keyboard, and usually it it more important than blogging. Thanks for another entertaining lost film festival. There are so many lost films that you could spend weeks just on silent comedy shorts or silent serials. I always enjoy the festival because it spotlights films from Europe and America. Slide interviewed Aurora Mardiganian in the 1980s and seems to have been greatly moved by her story. I’m glad that what there was of the festival entertained. I like showing something of what the wide range of silent cinema comprised. Should have included a lost Japanese silent by now, but I’m less familar with the sources. A choice selection of films, educational and entertaining; every evening a delight. And a rare chance to savour those pre-war vintages, always to be welcomed….and with fine company to match. I shall certainly keep this week free in my diary for next year.